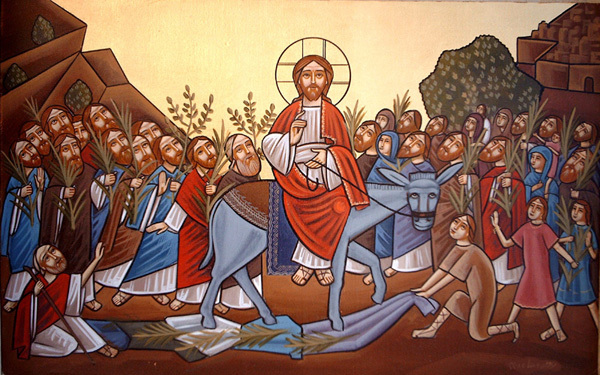 With the arrival of Palm Sunday we are now on the threshold of Holy Week which, we need to remind ourselves again, represents the highpoint of the Church’s liturgical year. It is after all ‘the Great Week’. 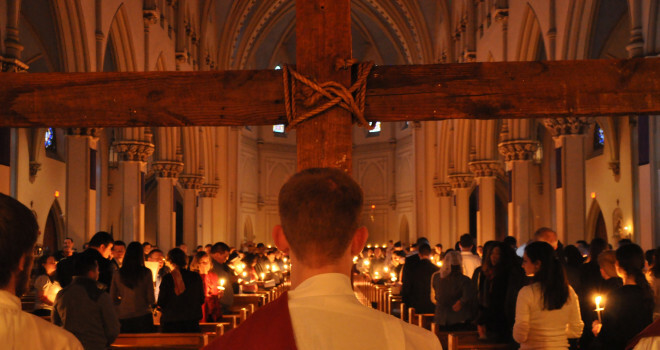 All the other Church seasons draw their significance and importance from what we remember and celebrate during the ceremonies of Holy Week, especially the Sacred Triduum. 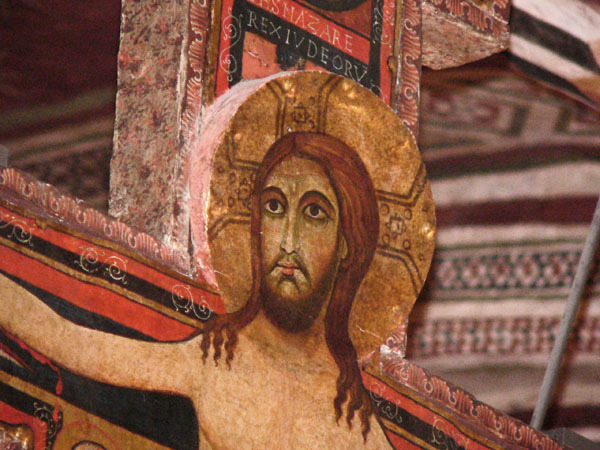 At the centre of the Holy Week liturgy stands the person of Jesus Christ. We accompany him, in spirit as it were, from his triumphal entry to Jerusalem on Palm Sunday riding a donkey, through what we know and cherish as the Last Supper on Holy Thursday evening with his intimate friends, followed by his arrest, trial and finally death by crucifixion on Good Friday. The liturgical events of Holy Week may be compared to a pilgrimage with Our Lord during the final stages of his earthly life. Mysteriously, but somehow in a manner that is real, we relive for ourselves these sacred and saving events. 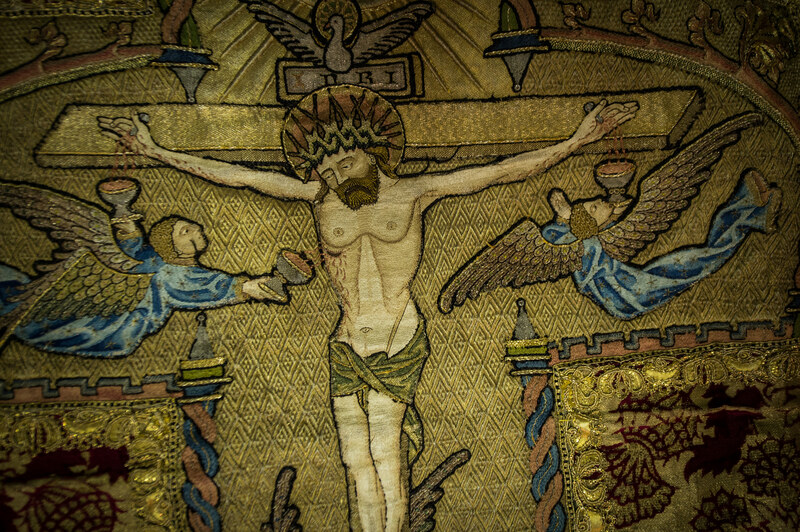 The wonder of the Church’s liturgy is that it permits us to be caught up in the Lord’s passion, death and resurrection. We are not just recalling distant happenings of two thousand years ago, but are sharing spiritually in the fruits and graces won for us by the cross of the Lord. 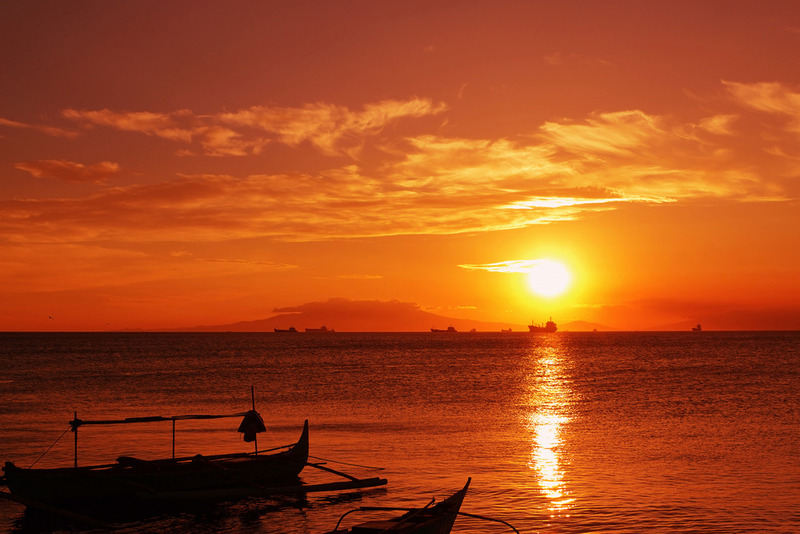 As we make our journey through Holy Week we should do so with a sense of awe and humility. 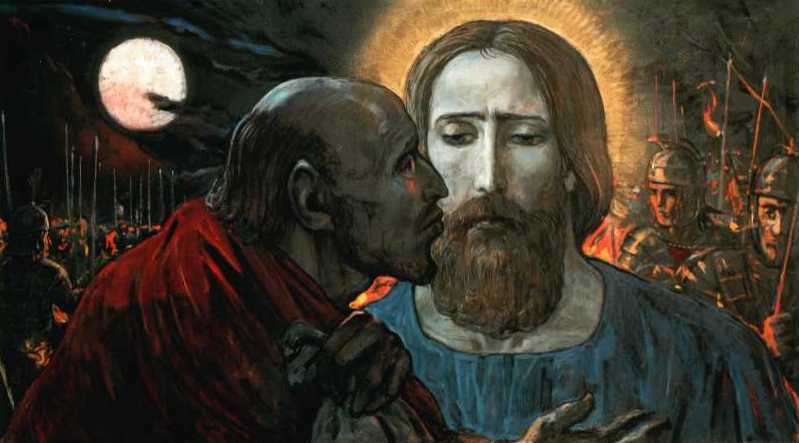 The One on whom we fix our gaze, the suffering servant as spoken of and prophesied by Isaiah, is experiencing the full depths of what it is to be human, emptying himself of his godhead and becoming a slave out of love for the whole of humanity. 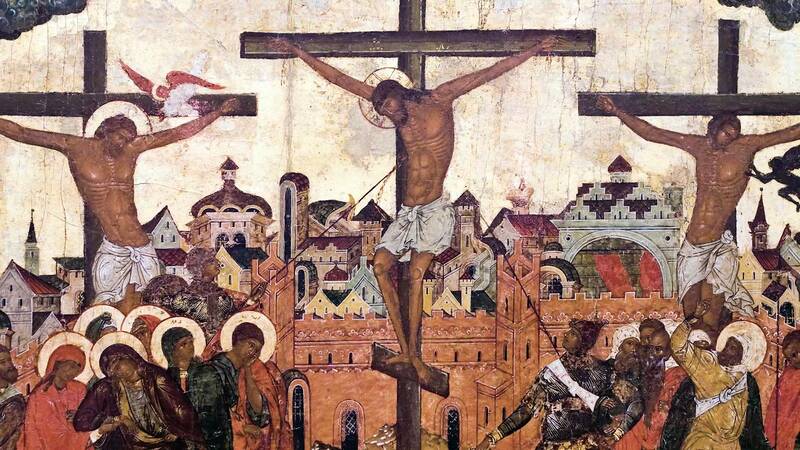 The mystery of Christ on the cross reduces us all to an attitude of silent reverence. In the presence of this mystery, words and human reason only take us so far. The cross casts a long shadow over Holy Week, but is far from concluding the drama. God the Father did not allow his Son’s faith and trust in him to be misplaced. His work of creation was not exhausted when he rested on the seventh day, according to Genesis. 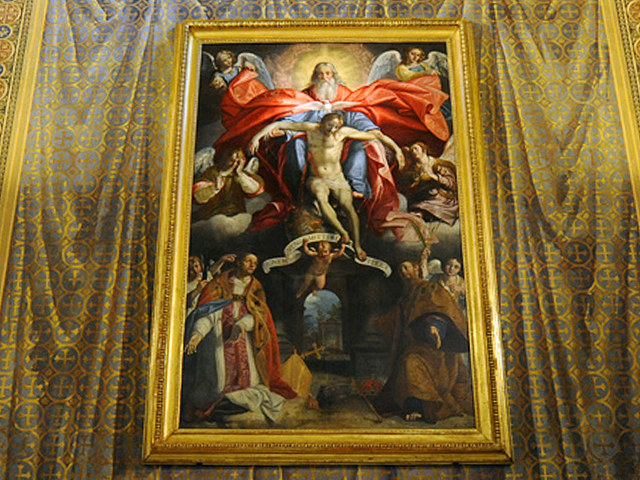 A further and unimaginable creative act was revealed when he raised his crucified Son from death to glory on the third day. Betrayal, suffering and wickedness would not have the last word, the risen Lord on Easter day would be the living proof of that. 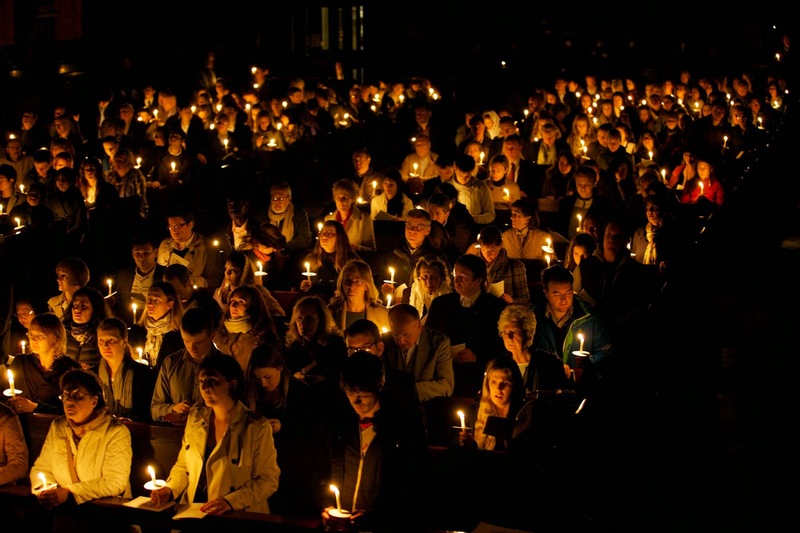 With good reason therefore we will recite and sing Alleluia many times during Eastertide! 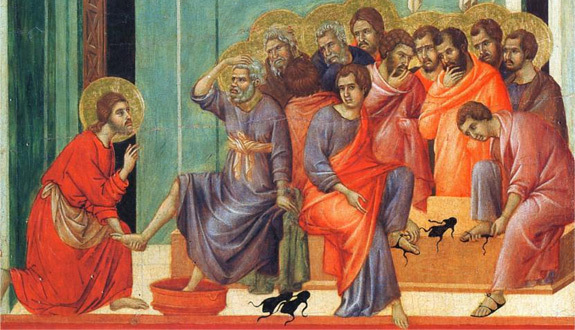 As we draw our Lent to a close, may the liturgy of this Holy Week and Easter Day prove to be a spiritual springtime for the universal Church and for each one of us. 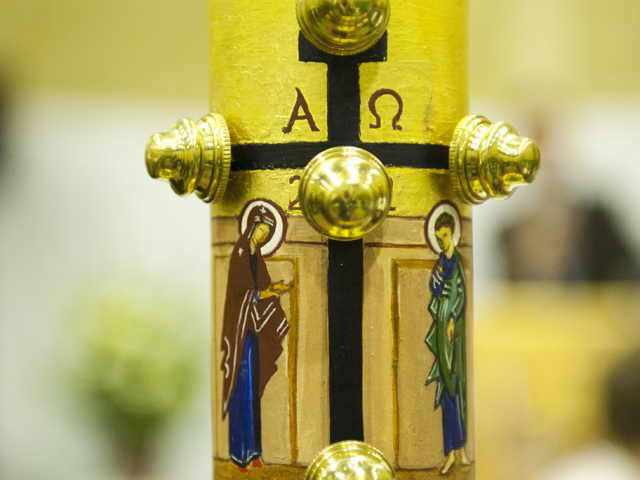 Until next week’s blog post – let us pray for one another throughout this Great Week! 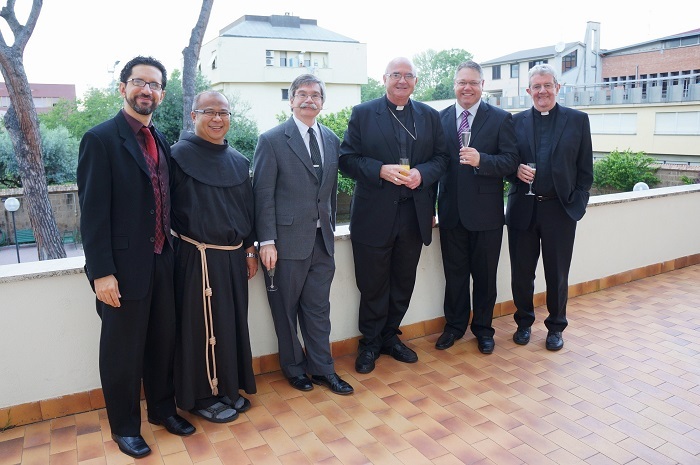 For the past few days I have been in Rome as one of three bishops on our annual Visitation to the Venerable English College and the Pontifical Beda College. Both Colleges, with St. Alban’s College, Valladolid, Spain, are the responsibility of the English & Welsh Hierarchy, hence the reason for these official yearly visits. 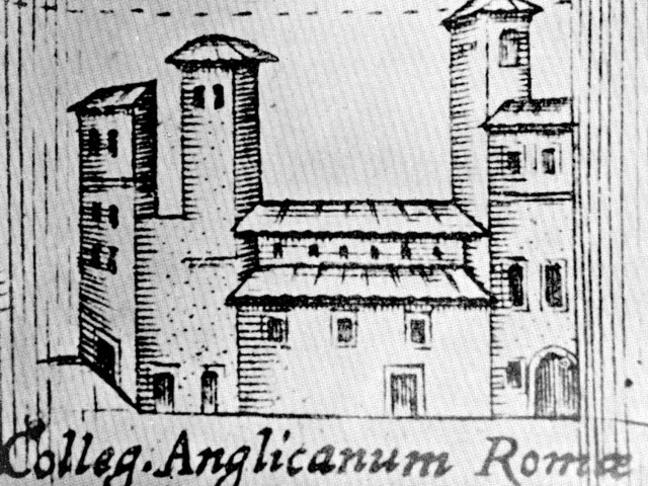 The Venerable English College has a long and distinguished history in Rome, stretching back over six centuries and more. It was originally a hospice for visitors and pilgrims from Britain, but for the past three centuries its principal purpose has been the training of future priests, mostly for the Church in England and Wales. 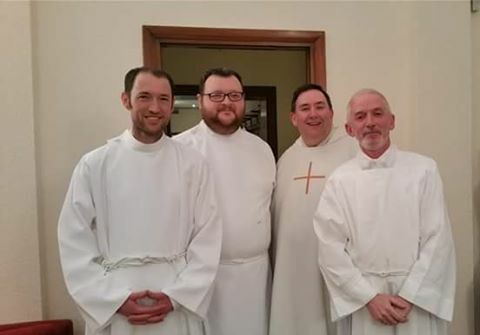 Occasionally the College hosts a few seminarians students from the Nordic countries, as well as a number of student priests engaged in further studies. 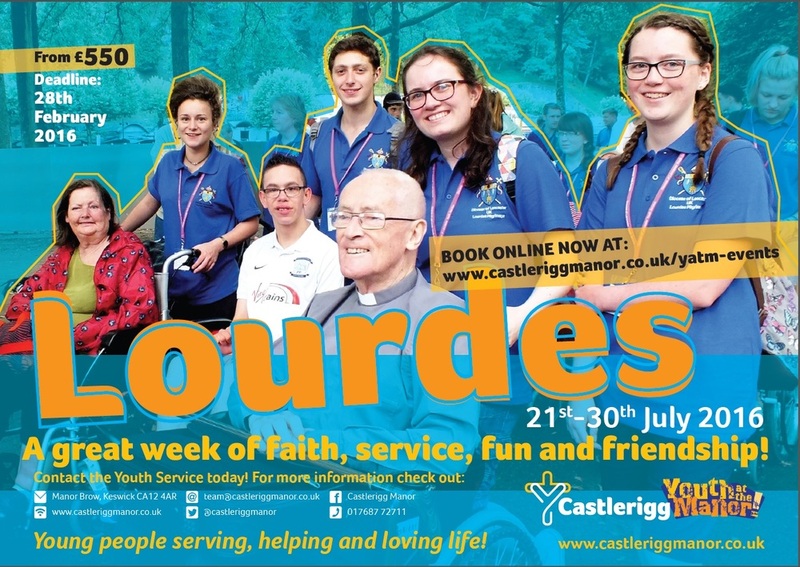 Our task as bishop-visitors is to encourage the staff and students in their important mission, to hear their concerns, and to offer every assistance we can, especially in the provision of and seminarians and formation staff for the college. 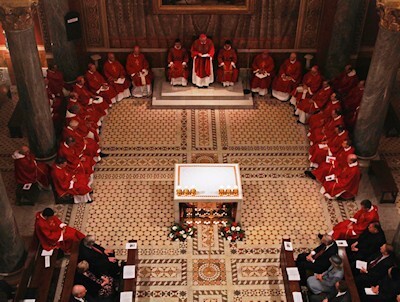 We are invariably well received by the whole college community and it is a privilege for us bishops to play even a small part in the life of such a venerable institution, and vital for the future well-being of the Church in England and Wales. 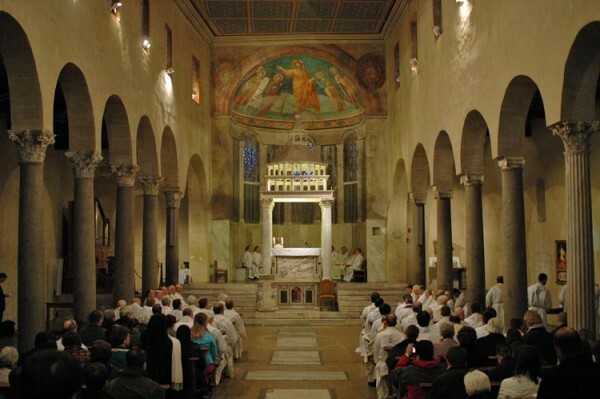 A particular pleasure during this Visitation was the celebration of the Roman Station Mass on Tuesday in San Lorenzo in Damaso, which is the parish church of the English College. I had the privilege of presiding at the concelebration. Well over three hundred lay people, Religious and seminarians gathered at 7.00 am for the Lenten concelebrated Mass, which is an exemplary way to begin the day. The practice of visiting a different church on each day of Lent for the Station Mass is an ancient one and wholly admirable. Occasions such as this do indeed boost a person’s faith. The second phase of our Visitation took us to the Pontifical Beda College, founded in the early 1850’s, which is blessed with its close proximity to the splendid basilica of St. Pauls outside the Walls, the original site of the martyrdom of the great apostle. 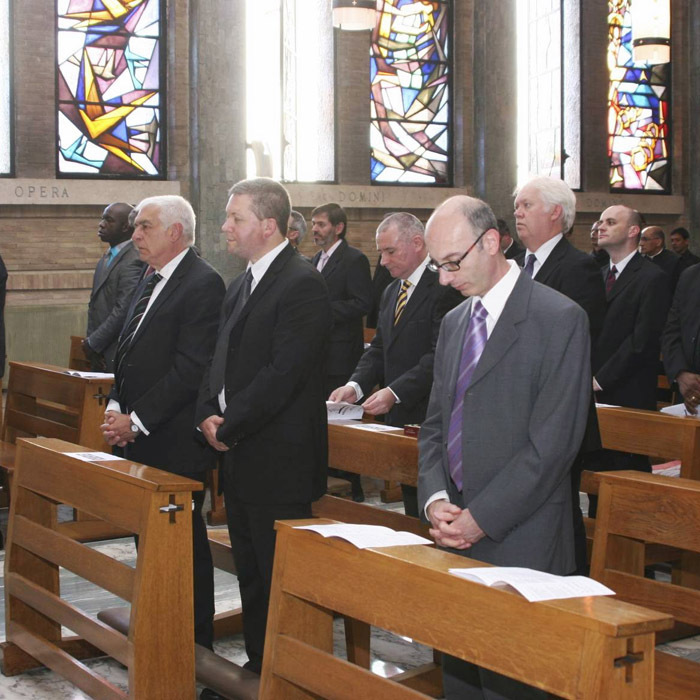 The Beda traditionally caters for seminarians of an older age, and more increasingly students from English-speaking countries around the world study there, giving the college nowadays a truly international dimension. 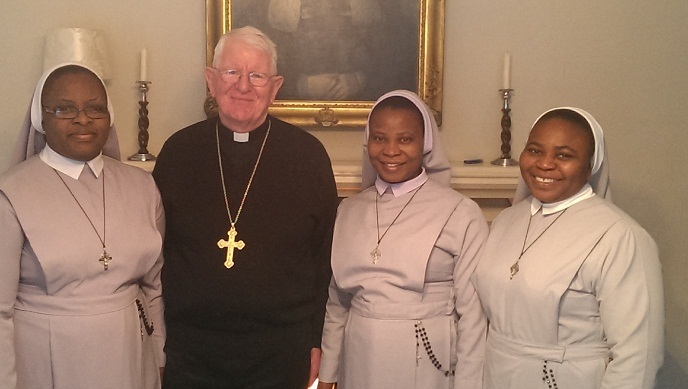 During our visit the second year students received the office of Acolyte from one of the visiting bishops, which marks an important milestone for these mature students on their journey to priestly ordination. Each Beda student has his own interesting life-story to relate before arriving at the college, and consequently brings a rich and enhancing experience to the seminary community. 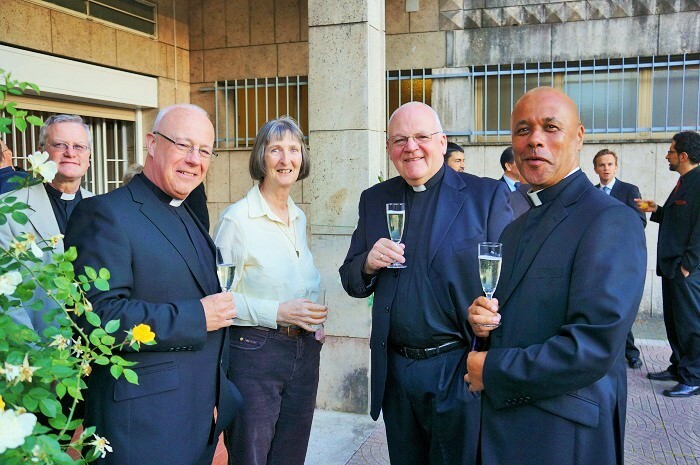 The equally warm welcome we bishops received at the Beda brought our Visitation to the Roman colleges to a highly satisfactory conclusion, and we thank the Lord for all the good that has been accomplished and continues to be in our overseas colleges. We do indeed keep them in our prayers. 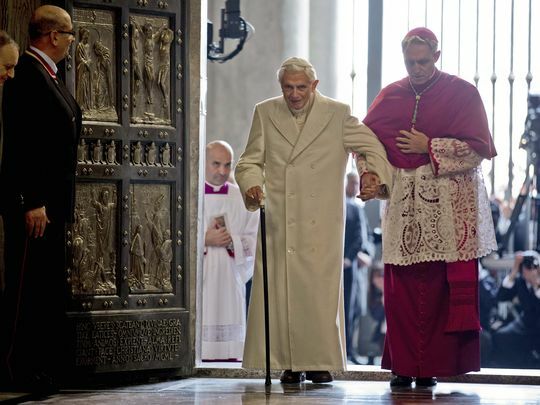 I did manage one morning to make a short trip to St. Peter’s and enter through the holy door for the Jubilee Year of Mercy. A steady stream of pilgrims were doing the same, and so the life of prayer and pilgrimage goes quietly on, invoking God’s grace on the peoples of the world. 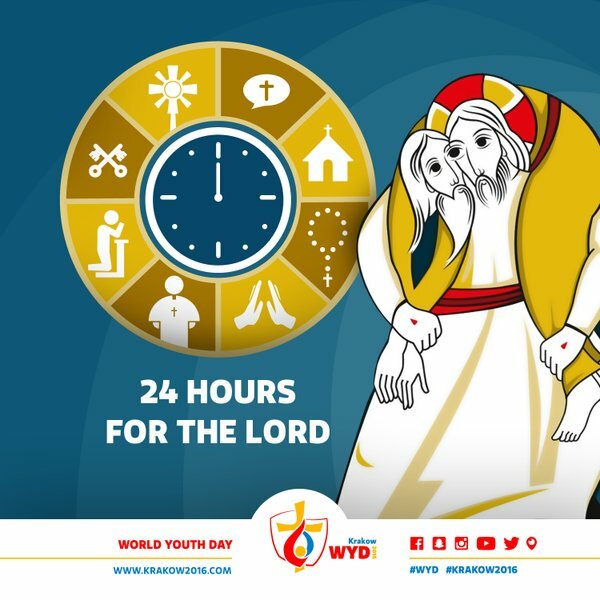 Many cathedrals, shrines and other churches throughout the Catholic world yesterday and today remain open at the request of Pope Francis for ‘24 Hours for the Lord’. For us in the Diocese of Lancaster, this means Lancaster Cathedral and Ladyewell Shrine. 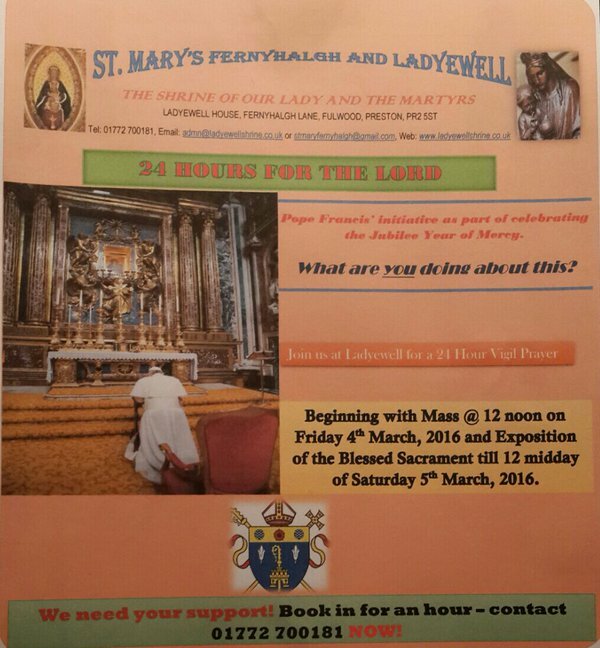 During this time the Blessed Sacrament will be exposed to allow for prayer and adoration in the presence of our Eucharistic Lord. 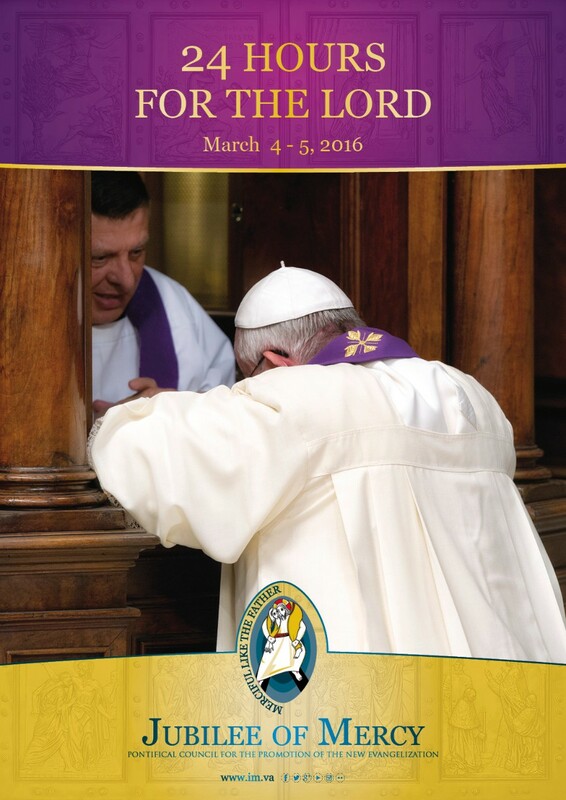 Priests are also on duty to provide the opportunity for Confession, the Sacrament of Reconciliation. 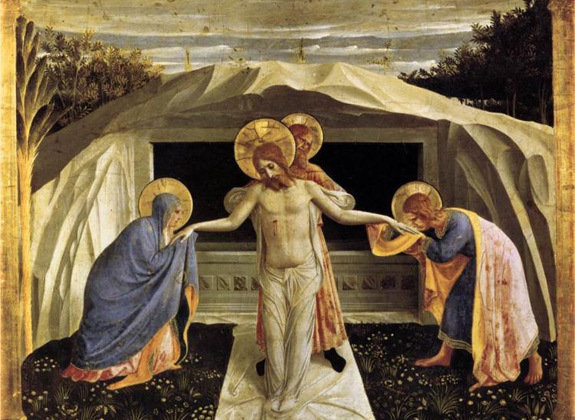 This period of twenty four-hours, falling in the midst of Lent, can be a powerful moment of grace and a wonderful way to prepare for the approaching feast of Easter. Prayer is never a waste of time. In an age when achievement and accomplishment are so highly valued, to stop even briefly each day and open ourselves to the gentle promptings of the Holy Spirit may not appear to yield much in return. That would underestimate the infinite power of almighty God who can both will and accomplish in ways far exceeding our understanding. 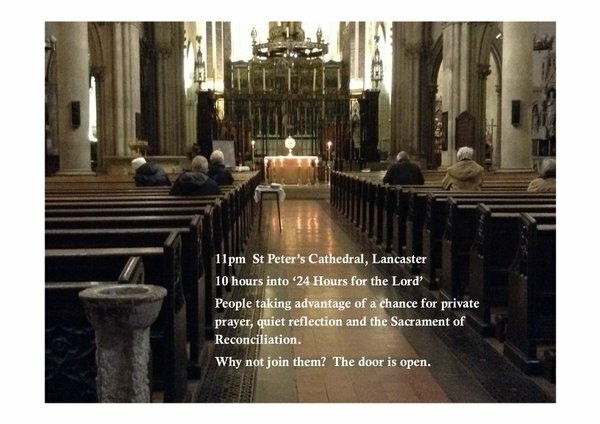 In the gospel of Ash Wednesday Christ exhorted us to enter our private room when we pray, where our heavenly Father alone can see and hear us. And that is such a consolation! 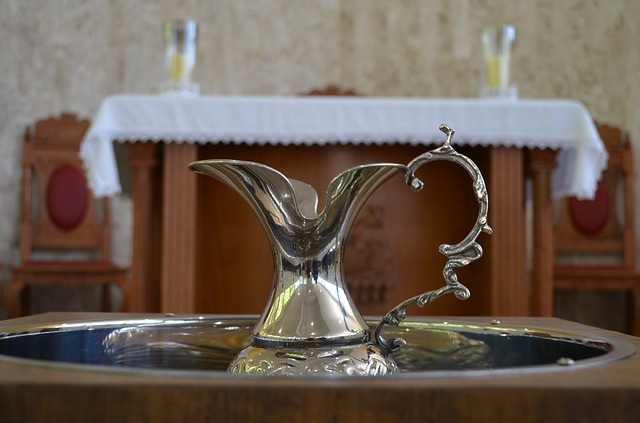 There is a part of us which thirsts for God, if we but knew it. All the other blessings which come our way in life can never quite quell what Saint Augustine described as the restlessness within us. Therefore time spent in prayer, whatever form it takes, makes us aware of our dependence on God, yet at the same time helps us grow in grace and so become more fully human just as he wants us to be. 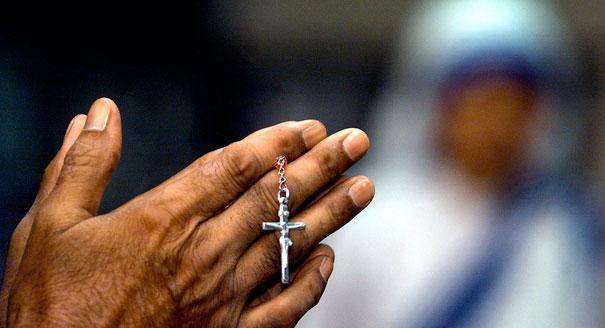 In these final weeks of Lent let us find time and space for prayer, the most important thing we will ever do!